I shot my new husband a suspicious look: Is this a trap? Andy shrugged: Uncharted territory. Can’t help you. Andy and Jay gave me identical blank looks. Jay scowled at me, made some notes in pencil. I tried to read them over his shoulder. They were indecipherable Chinese characters. Taking Spanish in high school suddenly seemed a stupid choice. Jay trundled off without another word. 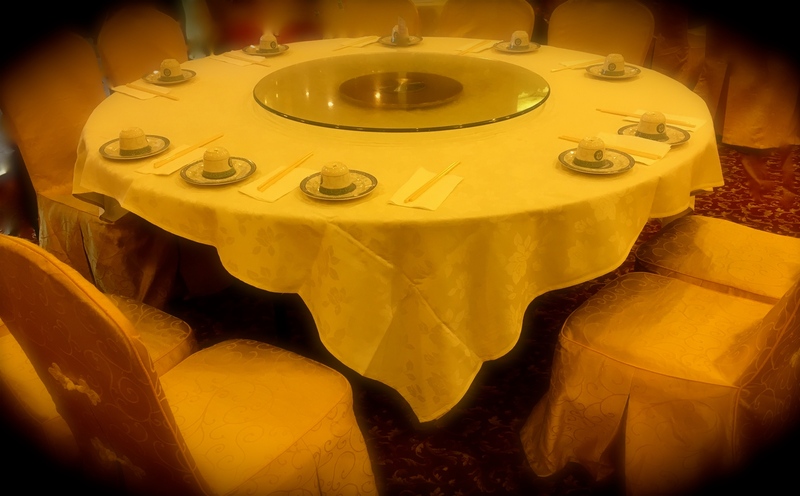 Two nights later, at our Chinese Wedding Banquet, the first course was served: shark fin soup. I tried not to think of all the poor, dead, fin-less sharks. I failed. I ate one bite. I did not have the jellyfish. Scallops in a taro basket. I fed most of my food to my husband. The guest thought it was adorable. Or maybe they were “oooing “ over the white girl using chopsticks. Message received, Jay. Message received. 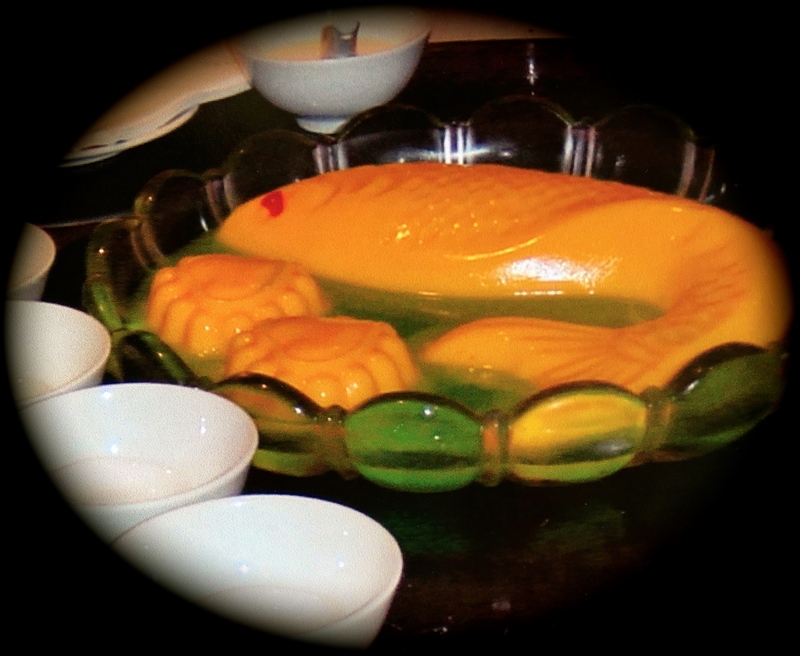 Actual mango fish from banquet. Jay was so impressed he took pictures. I did not take pictures. But I did eat the mango pudding. I can just say that I feel really sorry for you. Oh, yes. I wish there had been broccoli. I can’t remember rice at the banquet, but there must have been rice. I mean, it’s not a Chinese meal without rice. Did the family think you were rude? I don’t know if they thought I was rude, but it was really awkward and embarrasing for me. Back then I was still picky about Chinese food, and when they offered me the chicken head and heart because I was the guest… I couldn’t stand the situation anymore. Yes, at little understanding would have been nice. Do you think they just couldn’t comprehend a different mentality? Or they simply didn’t listen? They didn’t even ask. I think it’s difficult to understand how different a culture from the other side of the planet can be if you’ve never been there. Or at least I hope so. It looked like they were so proud because they picked such a high class restaurant. And then I didn’t est and ended up to look like the picky one. First off, sorry you were starving at the banquet. I’m not laughing at your discomfort (although it was kind of funny). This was just a really funny post. And it must have been really cute watching you feed Andy. Definitely true love. Andy will eat anything for me. Except the awesome candy cane/ chocolate chip meringues I just made. Because he hates mint and chocolate together. Jellyfish are no problem, though. Weirdest taste buds EVER. Oh, yes, the Pacific Ocean is my friend. I couldn’t live without it. Haha leave it to the Chinese to order all seafood only! If it’s not seafood it’s not worth it. Poor autumn! Was the mango jellyfish good at least? Andy taught himself to make an amazing hot & sour soup after the banquet. He even makes the stock from scratch. Soooo good. Yes. Seafood in Hawaii, and nothing but! I think the mango pudding was pretty good. But that could have been because I was starving. Is Andy really that good a cook? How about a post on his culinary skillz?? Andy hates mango also — it’s the only food besides chocolate mint he can’t stand. Did you grow up with the mango tree in your backyard also??! Meanwhile, I think mango lassis are to die for. I think Andy averages 1 post a year. I can’t even get him to comment anymore. But maybe he would do a cooking interview. Get your questions ready! I loved your description for cheung fun though–“fat noodles wrapped around beef patties with savory sauce”–kind of like describing a Chinese version of a Big Mac. LOL on the mangoes. Andy’s dad bought a machine that vacuum seals food specifically for the mango bread. I guess mangoes are ubiquitous in Hawaii. Like oranges in LA or zucchini on the east coast. Oh man. You married into the wrong kind of Chinese family… the kind that lives close to the ocean and eats seafood like Americans eat chicken. XD Chinese from less coastal areas would probably still have the fish (the symbolism, you know), but they’d probably have other foods you probably could’ve actually eaten. Did you guys have to tour and toast the tables? Did they try to get you guys drunk? If it makes you feel better re: shark’s fin soup, a lot of it is just imitation shark’s fin these days due to the inhumane fishing of shark’s fins. I don’t know if it was the case at your wedding, but in many countries where sharks fin soup is banned, people can still order it at restaurants, but they’re probably just eating fake shark’s fin. I KNOW! I love mangoes. Philippine ones are to die for. It was my favorite food when I went to Hawaii. No, not so much with the drinking. Or maybe just not compared to what my family can drink. I might be jaded. I am very glad to hear that shark fin soup is all synthetic now. Poor sharks. Hey, I like jellyfish! They are crunchy and soft at the same time! That crustacean joke… OMG hahaha. You may have ALL my jellyfish forever, Marta. I hate seafood, too. And I got a lot of shocked looks for it ’cause I’m from Hawaii and all, but bleh! It smells bad and I love the animals of the sea. We should be adoring them, not eating them. Fish is alright – I can handle, but I don’t like to eat my pets…feel ya, girl, feel your pain. Thanks! Well, I would say you are definitely from Hawaii. Just with a different perspective. By all rights, for as many times as I got stung by jellyfish at Rehoboth Beach on the East Coast, I should have eaten some of those jellyfish. Vengeance, you know. Yikes…. seems like Jay only inquired about your preferences, so he could order everything you didn’t like. Ugh! ‘Crushed Asian’, Crustacean! Hilarious. Lol. It certainly felt that way. But it is also possible that Andy’s parents simply do not hear what they do not wish to hear. Sometimes I wonder if they like you. Is it a culture of not trying to please a guest? Back east pork is big in Chinese food along with the seafood choices. I love mangoes and the best I’ve ever had were in Hawaii! AH, but I am not a guest! I am family. And female. And it is expected that I will do as my mother and father (in-law) tell me. They should perhaps have interviewed my parents first to see how obedient I was, rather than worrying about how smart I might be or how many children I might bear. I dated a Polish guy for a while. He was from the Chicago area and we went there for Christmas one year. His Mom made all the traditional dishes. I think I ate the mashed potatoes. There was duck and blood soup and some other stuff that I had no idea what was in it. They had a pizza for me! First you couldn’t eat much at your wedding reception, and then you starve at the Chinese wedding banquet. But the Chinese wedding banquet is more for Sunny and Jay’s family/guests. Putting on the show, you know. Been there, and my girl knows I’m not big on entrails or stewed fish heads. Was not impressed. Only option, drink more, hey I wasn’t driving. Did you at least get some edible mango pudding? Fish heads — oh, no, they still stare at you. But at the same time, in a country with a massive population and not enough food, it does make sense to use every single part of the animal. Very efficient.